The tiger is the third symbol in the Japanese Zodiac. People in ancient Japan believed that tigers used to be stars in the sky because of their beautiful fur. This symbol represents “decisiveness” and “wit”. Tigers are proud, courageous, and generous. Being decisive and quick-witted, they are potentially great leaders. On the negative side, they do not like to follow orders, and can cause interpersonal friction with others. Sometimes fail due to overconfidence. Have great sympathy for those they are close to and love. Tigers are most compatible with horses and dogs. If these three come together, it generates a great positive power. Tigers also have a mutually beneficial relationship with boars. Monkeys are the least compatible with tigers. 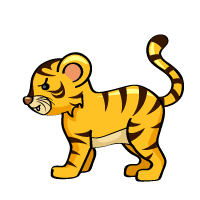 In Japanese, a tiger is “tora” in romaji and is written as “虎” in kanji. In the Japanese Zodiac, however, a tiger is written as “寅”.